3.5" x 4.5" closed. 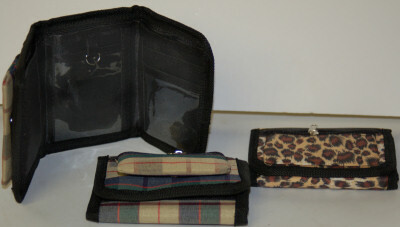 Opens to 9.5"
Tri fold wallet with two places for cash, one zips up and the other is open. Holds 3 cards and a clear slot for ID or License in the center. The front has a zipper pocket for holding change. 4 hidden pockets. Velcro holds the wallet closed and it comes with a black string to tie to a belt loop for making sure that your wallet stays with you. Perfect for a youth basket enhancer, prize, gift, and so much more!